Click the button to go the my Jardine Google Site. I am very excited to begin this semester. This class is for high school credit. We are going to have fun creating, responding, connecting, and presenting our ideas, our processes, and our final work, while learning studio thinking processes that will help you beyond your time within the art studio. Above is a copy of the syllabus. Please read, share with your parents, and become familiar with classroom expectations. All lesson will be posted here and on google classroom. You are expected to check this page and google classroom sites as I will have video's, slide shows, and examples of projects we are working on. Please know it is your responsibility to watch these videos, and slide shows in the case of an absent so you know what to do when you get back to the studio. Please come back prepared to create. This will help you maximize your time in the studio. Draw your name to fill the page in a specific font, style, design. Option one: create a theme and use at least 4 elements of art in your composition. Even the negative space, or white background must be a conscious choice for your concept. Option Two: Use one of the op art patterns from the slide show to design your cover. The whole paper or both the front and back of your sketchbook must be covered in design or creative theme. My project is successful if I have met the five studio habits listed on the objectives, in addition to the completing the options above. My work shows great time and consideration was taken in my name design. See the rubric below. Lesson Introduction: Dive into art making. Create a design on your cover. The challenge for this semester is to create a visually compelling cover for your sketchbook. Lesson Objective: Create sketchbook cover that uses a name as the Students begin to learn studio thinking processes on day one. Day one: Design Challenge: Draw your name in a type, font, style of your liking. Make it fill the page. Day Two: Decide if you would like option one or option two and create a composition on the front and back of your cover using these ideas. Make sure your work is unified. Day Three: Continue to draw and complete your work. Day Four: Assemble your sketchbook and take a picture of your final work. Submit it to google classroom. Materials needed: Paper, rulers, compass, ink pens, sharpies, colored pencils, and markers. Why do we have to have one? To showcase our growth and interests as an artists. To share our work and to create a digital presence. To learn the 21st century skill of building a website. I can write an artist statement that reflects where I am as an artist. I can upload photos to my site in order to show my personal growth both short and long term. I can understand and demonstrate digital citizenship. Steps to creating your site. Click on the new google sites on the bottom right column. Click on the plus sign in bottom corner. On the right you see three tabs. Inserts, pages, themes. The insert page helps you build each page. The pages tab creates separate pages and the themes controls your font styles and size. Your portfolio needs to have a Home page, a page titled My Artwork, and a page titled Artist Statement. You will be expected to write a detailed artist statement. In your sketchbook you have an artist statement worksheet. Follow the prompts and you will great. tto see my portfolio example. Artist Statement: Write a detailed artist statement. Please be mindful of your grammar, and punctuation. Follow the artist statement flowchart in your sketchbook. Here is an electronic copy of that document. Once you are finished, publish it using your first and last name and then submit the link to google classroom under the portfolio assignment. Set the view for Topeka 501 so you may share it with future art teachers. Their invisible audience – many students choose to set their digital portfolios to be limited to users on our school’s Google Apps domain. However, that means that everyone in our community who has an account can access student work. Eportfolios can be viewed by students, teachers, administrators, parents, and anyone with access to a username/password. This should influence students to write informatively without oversharing, and place emphasis on grammar and spelling. Digital citizenship and having a sound understanding of creative commons, permission, and giving credit to others for their work. Inserting an image by linking to the URL of the image online rather than taking a screen snapshot or dragging a copy of the image to the desktop. By using the URL, students can simply point to something else online. The alternative is to copy/take/steal a version of it which is tantamount to theft (depending on how the work is licensed). "Digital citizenship" is an umbrella term that covers a whole host of important issues. Broadly, it's the guidelines for responsible, appropriate behavior when one is using technology. But specifically, it can cover anything from "netiquette" to cyberbullying; technology access and the digital divide; online safety and privacy; copyright, plagiarism, and digital law, and more. " for more resources check out this page. How to create an electronic portfolio. Essential Question: What is visual plagiarism? What responsibilities do artist have when considering concepts, themes, and ideas for potential artwork? Understanding these questions are important because they help clarify the ethical and legal parameters in which we create and present artwork. Success criteria: I am successful in this lesson when I have completed the slide show and successful demonstrate how to set parameters in my search engine to ensure that I am not using copy write material. References: Cathy Tanasse, Presentation @ NAEA Seattle Conference. Zentangle - A ZENTANGLE is an abstract drawing created by using repetitive patterns. It is usually structured within a certain shape. 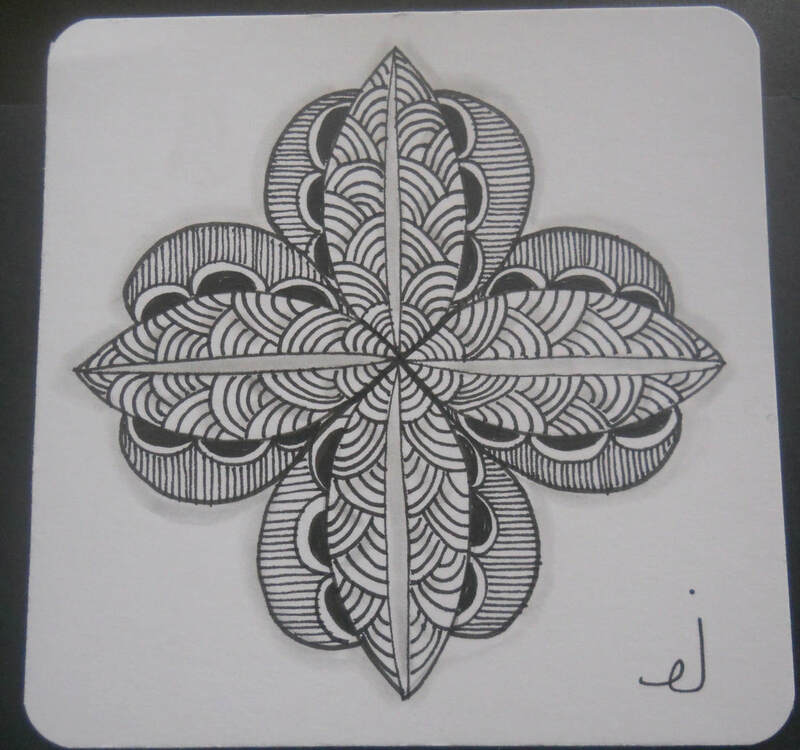 Drawing a Zentangle is entertaining, relaxing, and a great way to express yourself creatively. String - A string is generally a random line drawn in pencil which creates an area within which you draw your tangles. Step 02 – Corner Dots Place a light pencil dot in each corner, about a pen's width from the edges. Now it’s no longer a blank piece of paper. Step 03 – Border Connect those dots with a light pencil line, straight or curvy, to create a square. This is your border. Step 04 – String Inside the border, draw a light pencil line or lines to make what we call a "string." The string separates your tile into sections, in which you draw your tangles. A string can be any shape. It may be a curvy line that touches the edge of the border now and then, or series of straight lines that go from one side of the border to the next. Step 05 – Tangle A tangle is a predefined sequence of simple strokes that make up a pattern. Draw your tangles in pen inside (usually) the pencil strings and borders. Step 06 – Shade Add shades to parts to create positive and negative space. Step 07 – Initial and Sign This is art you created. On the back, place your name, and hour. Step 08 – Appreciate Hold your tile at arm’s length. Turn it this way and that. Appreciate what you just created. This week, we will begin our exploration of zentangles practicing 3 thumbnail sketches in our sketchbook. The zentangles must be at least 4 x 4 inches and have detailed attention to line, shapes, and patterns. After completing your three thumbnail sketches, you are going to complete a final one using fine tip sharpie and 6X6 paper. This work is going to be our first class critique and will be displayed in the hallway. I want you to think about how you can use the principles of design to help guild your creative process. Day one : Draw Three thumbnails in your sketchbook Pick a couple of the design principles in your notes and use them in your thumb nails. Day Two: Pick the one you like best and draw it on 6x 6 inch paper. Use pencil first then go over it with your sharpie. 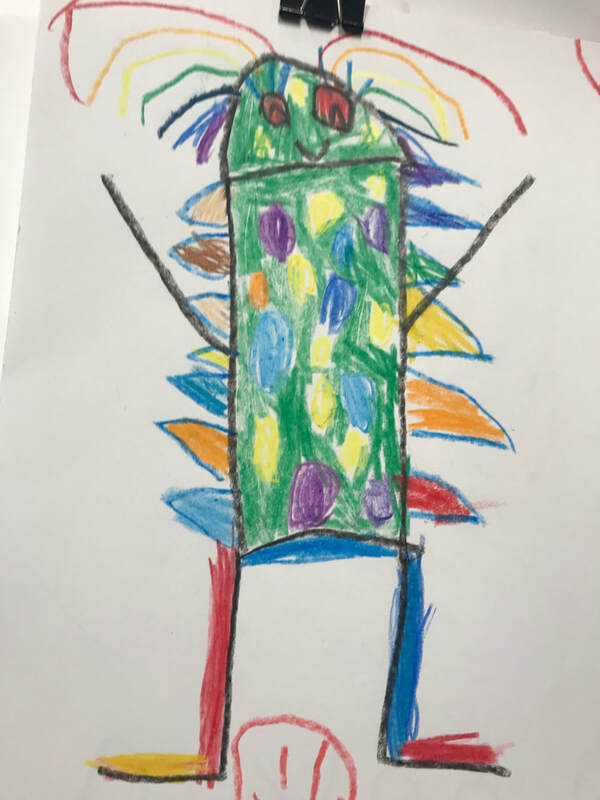 Last Day: Take a picture of your final work and upload it with your picture of sketches to google classroom. Don't forget to turn it in to Mrs. Latham, as this is getting hung and will be our first formal critic. How does the addition of value in our work affect the final image? How can drawing from observation help us improve as artist? How can it help people in career other than art? •How does learning about art impact how we perceive the world? Success Criteria: My project is successful when I have drawn a contour drawing that is accurate in shape and proportion and is completely filled with small fractured value scales that smoothly transition from light to dark. 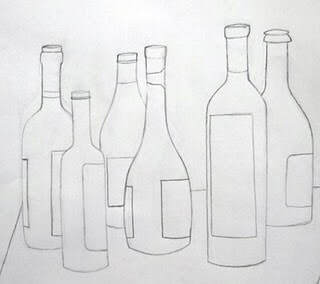 Learning Objective: I can draw a contour drawing of a bottle and apply geometric retractile lines so that each shape is a miniature value scale. I can create value scale using charcoal and chalk. Cooperative learning strategies: quiz, quiz, trade vocabulary cards. Draw a contour drawing of a bottle to scale. Fill the page. Divide the drawing into sections using shapes and lines. Don't make your shapes too small. The lines should shatter the drawing to look like a puzzle of broken glass. Fill in each shape, both in the possessive and negative shape with its own mini value scale. Get creative and make sure you fill all your spaces. Spray hairspray over it, Take a picture and turn it in to google classroom. Upload your work to your digital portfolio. Introduction to Value and Grid Drawing. Back by popular demand students are getting pumped for a lesson that has become quite the tradition at Jardine. “If you’re overwhelmed by the size of a problem, break it down into many bite sized pieces.” Breaking the drawing into “bite sized pieces,” or small squares, helps students feel less overwhelmed. Choose a photograph and and resize it to fit the doc so it’s 8 ½ x 11.
click on photo and then grab the blue dot in the lower right corner and drag it to fit the page. NAME THE FILE YOUR NAME/ HR!!!!!!!! Submit to the classroom shared file in google classroom. Choose a piece of white drawing paper – 9 x 12. Draw a grid using ½ x ½. For an 9x12 piece of paper, students will have 18 spaces horizontally, and 24 vertically. For a 1 inch grid you will have 9 horizontally and 12 vertically. Draw the same grid over your photograph. It must be ½ inch by ½ inch squares, unless you have permission to do a 1 inch grid. From the top right corner, number your boxes from 1-24 vertically and then 1-18 across the top of your grid paper. Number it again the same way on your printed photo. Lightly drawing the contour lines of the photograph. Use the light box if you need. Be sure to look at each individual box as you draw. looking at each ½ square at a time from your photograph, draw the values and shapes of each little square you see from your photo, onto your grid. Lessons: Grid drawing and self-portrait. Essential Questions: What role does persistence play in revising, refining and developing work? How do people contribute to awareness and understanding of their lives and lives of their communities through art making? I can draw a grid using precise measurement and straight lines. I can identify and transfer the values I see, using a full range of values and smooth transition. Objective: In this lesson we are going to shift to a different method of drawing. Students will be introduced to the importance of grid and how it allows us to keep our work in proportion. Students are building upon and further explore the use of value and line weight within a drawing. Introduction: This is an introduction to a new method of drawing. We will create a self-portrait using a grid. Building on the influence of value, we are now incorporating the idea of space and texture. Once our portraits are finished we will cut them and weave them in with the photocopied version that you have been working from. Materials: white paper, a photocopy of the students’ pictures. (These will have to be taken and printed ahead of time), drawing pencils, tracing paper, erasers, scissors, rulers, tape, glue, black paper to frame their work. Resources: Mrs. Folk, Lyons High School; I wanted to do a grid drawing for part of my unit and I remembered how much I loved doing this. Demonstration /Guided Practice: This project is going to need a lot of scaffolding. Students are going to have to draw a grid ½ inch by ½ on both pieces of paper. I have value scales, on the table and a light box for students to use to help find the contour lines of their image. Lesson Introduction: A critique is an oral or written discussion strategy used to analyze, describe, and interpret works of art. Critiques help students hone their persuasive oral and writing, information-gathering, and justification skills. ​How does collaboratively reflecting on art help us experience it more fully, and develop it more completely? How does knowing and using visual art vocabularies help us understand and interpret works of art? How is personal preference different from an evaluation? Success Criteria: I am successful in my discussion when I have participated in the critique and used my art vocabulary words associated with the lesson. Learning Objective: I can talk objectively about art by responding and connecting to the work of others? 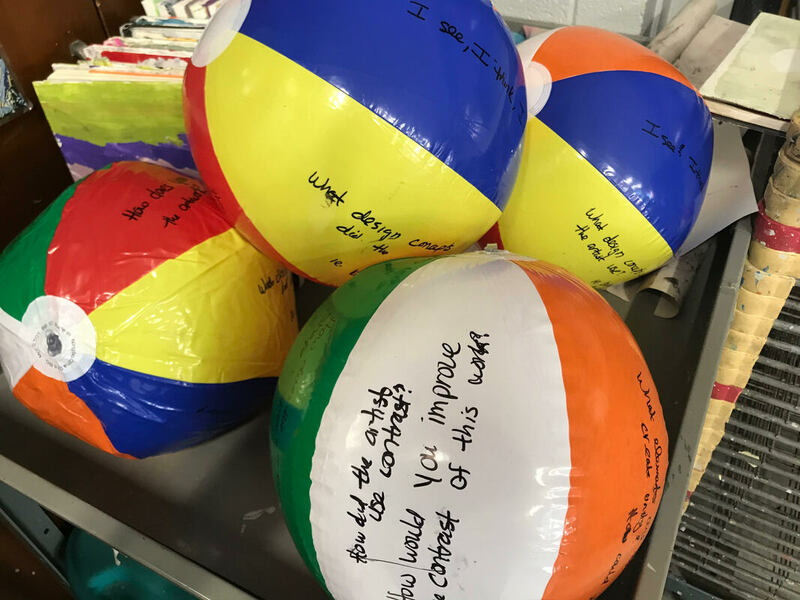 Collaborative activities: beach ball critique/ small groups. Grading Format: observation of participation and use of vocabulary words. 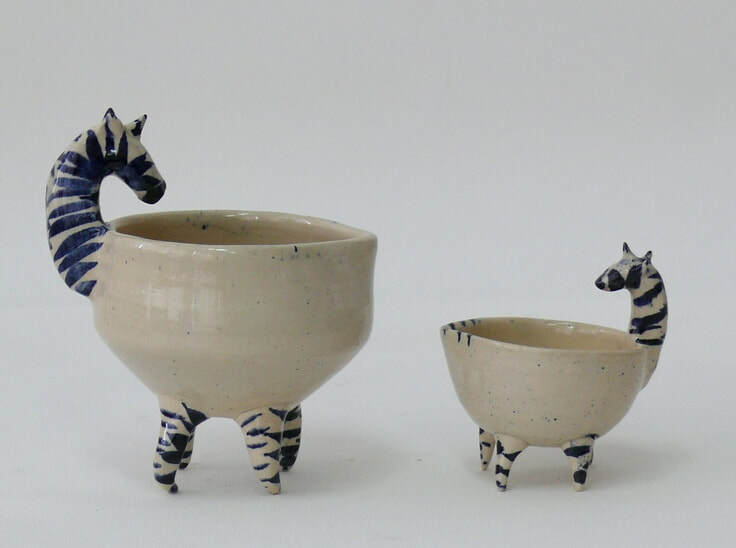 Lesson Introduction: Pinch- Pot animal bowls. The pinch pot is a great way to introduce the feel and limitations of the clay body. 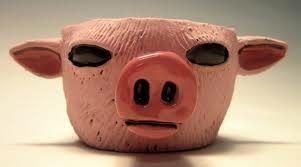 Students will extend their knowledge of the pinch pot into a sculptural practice as they have to turn the bowl into an animal of their choice. Essential Questions: Why do artist follow or break from established traditions? How do artist and designers learn from trial and error? Why do people value objects, artifacts, and artwork and select them for presentation? Success Criteria: I am successful when I have turned in a well crafted and well constructed pinch pot that has taken on the theme of an animal. My bowl is able to hold candy or other small materials. Learning Objective: I can create ceramic work that can be both functional and decorative. I can demonstrate proper construction of clay and identify the various stages of the clay body as it dries. I can use glaze effectively and explain the importance of the kiln. Anchor Standard 10: Synthesize and relate knowledge and personal experiences to make art. Enduring Understanding: Through art-making, people make meaning by investigating and developing awareness of perceptions, knowledge, and experiences. Collaborative engagement: Think, pair share to come up with concepts in the planning of our work. Collaborative engagement during building and clean up as well. Students will be guided through concept strategies to plan for their ideas in sketchbook. Come up with three different ideas, (either different animals or different ideas for one animal) and figure out how they would build a bowl with these ideas. Discuss ideas with teacher and show your sketches. Students then get clay and begin making their bowl, and then learn to add details with slipping, scoring, blending, to make it an animal. Materials needed: Stoneware clay, Clay tools, kiln, grazes and brushes. COLLABORATIVE clay monsters with k, 1 and 2. ​We will look at some artist and art movements that are taking the creative ideas of children and turning them into art. What factors prevent or encourage people to take creative risks? How do artist and designers learn from trial and error? Success Criteria: My Monster is successful when I have completed the task using slab and hand building techniques and have created a visual likeness to my clients drawings. My monster must be constructed using slab building techniques or adding together two pinch pots but IT CAN NOT BE A SOLID CHUNK OF CLAY!!!! My monster must be at least five inches tall, can stand on its own and be glazed to reflect the ideas of the client. If the artist decides to give the monster to the client, extra credit will also be available. 15 points. I can work from the ideas of 2d to 3d creating work that can stand. I can work collaboratively with my peers to complete the project. I can use slab building and, or double pinch pot building methods to create clay monster sculptures. I can demonstrate proper construction of clay and identify the various stages of the clay body as it dries. I can use glaze effectively and explain the importance of the kiln. Collaborative activities: students are recreating work drawn from elementary students. Design students are working collaboratively to help each other build and to clean up between each class. Look critically at your drawing. How can you turn it into a 3d form? Discuss your strategies with your ½ table team. Get you clay and roll our your slabs. Let them harden up just enough to begin building them. Begin slipping, and scoring the corners of your slabs to create a form. Add the details such as limbs, horns, teeth, coils, etc. Smooth out, clean up, blend, and add texture where needed. Take one last time to make sure it is reflective of the elementary drawing. photograph both your work and the clients drawing and turn in to google classroom. Make sure your put your initials and class hour on the bottom before putting on the cart to go to the kiln closet! ¿Cómo puedes convertirlo en una forma 3d? Discute tus estrategias con tu ½ mesa de equipo. Consigue que la arcilla y rodar nuestras tus losas. Deje que se endurezca lo suficiente para comenzar a construirlos. Comience a resbalar, y marque las esquinas de las losas para crear una forma. Agregue los detalles como libs, cuernos, dientes, bobinas, etc. alise, limpie, mezcle y agregue textura donde sea necesario. Tome una última vez para asegurarse de que refleja el dibujo elemental. fotografíe su trabajo y los clientes dibujando y entregue el aula de Google. ¡Asegúrese de poner sus iniciales y horas de clase en la parte inferior antes de poner el carrito para ir al armario del horno! Materials needed: Clay, sculpting tools, glaze, kiln, sculpting tools, plastic. Grading Format: Peer assessment form rubric/ Conference with Teacher. This lesson was created in collaboration with Bridget Lee of Jardine Elementary Topeka Ks. 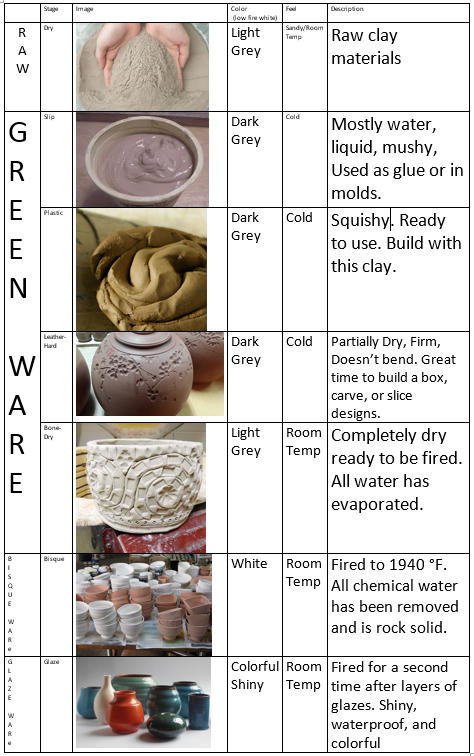 The stages of clay/ Glazing our ware. Lesson Introduction: Students will watch a video and slideshow introduction. Essential Questions: How do images influence our view of the world? How does knowing the contexts, histories, and traditions of art forms help us create works of art and design? How does art help us understand the lives of people of different times, places, and cultures? Success Criteria: I am successful when I have safely created a plaster casting and added paper mache. My mask is reflective of the Venetian carnival era and is completed with gesso, paint, and decorative items. Learning Objective: I can create a Venetian inspired mask by way of creating a mask that is either symmetrical or asymmetrical in balance. National Standards: Anchor Standard 1: Generate and conceptualize artistic ideas and work. Anchor Standard 10: Synthesize and relate knowledge and personal experience to make art. Collaborative activities: Students will cast each others faces, and work together to clean up. Instruction & Process: We will watch a slideshow. I purchased this lesson form Klaire Lockheart so I Will not be posting the slideshare on the blog as she owns the rights to this slideshow. I will demonstrate how to do this in each class. 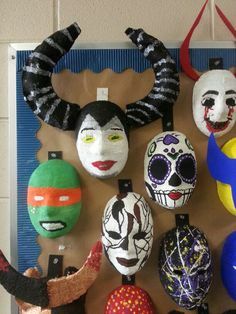 Materials needed: Pencil, erasers, color pencils, 2 yards of plaster per student, scissors, plastic wrap, petroleum jelly, water, newspaper, paper mache paste, gesso, brushes, acrylic paint, hot glue gun, and shiny jewels. 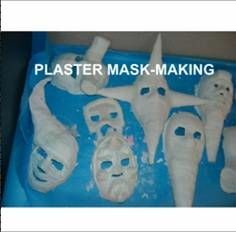 Resources: Venetian Plaster Masks, teacherpayteachers.com/Store/Art-With Lockheart. Take a picture of your work and turn it in on google classroom. I would like to display some of these in the cases around school. Tome una foto de su trabajo y entréguela en el aula de Google. Me gustaría mostrar algunos de estos en los casos alrededor de la escuela.